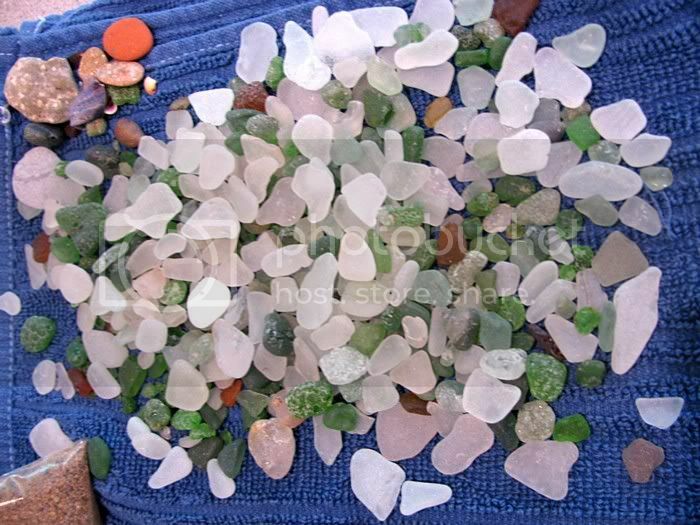 My grandmother used to have pieces of "Sea Glass" which was parts glass bottles that had been out in the ocean for a long time, and rubbed frosted and smooth by sand that the motion of the tide. It looked really cool. But obviously only in small amounts. If you could tumble the glass, like people tumble rocks, you could really make a cool grow bed if you had a lot of free glass. Obviously it would take some time, maybe if you had on old cement mixer, there would be a lot of glass "sand" that would come out out of the process and I am not sure what one would do that with. Here is my thought. Here is what I can get locally from a supplier http://www.landscapeandgarden.com/index ... kandgravel what would be the best option in that list. sample of sea glass. Looks like it could be a good media. How about, as a cheap hydroton alternative, you get a whole bunch of clay pots and such, then break them up into small pieces, 1/2" to 1", then use that? Would it be too sharp/flat or would it be all the wonderful performance of hydroton save the voids created by it and the extreme surface area of the spheres? I like the idea. I my guess is that in somes place terracotta is more accessible than others. It wouldn't let light in like the glass. (I was only thinking about how cool the glass would look in the beds, not about it letting light in). Maybe the terracotta could be tumbled for a short time as well, to take off sharp edges. I'm about to setup my first system, and have decided Hydroton is WAY too expensive. Where I live we have a company called the Old Red Brick company which provides crushed red brick gravel of 3 different sizes for $80 ton delivered. I am going to get some for an area I want to put gravel on, but it occurred to me that it might make a good grow media. It's effectively clay, so is porous, and they have (mostly) been cleaned of mortar. My only concern is that it may be heavy (I'll just have to deal with it! ), and depending on how much mortar is left on the gravel the cement may cause some ph problems (?). Sounds fair - would just be getting a bucketfrul first and doing some tests. First with regard to pH, then a test with some of it in a tank with some fish that you're happy to potentially lose (cheap goldies or something). There is a cheaper version of hydroton available - it's called nutrifield aqua clay, but apparently it's got heavy metals in it - made in china. That's anecdotal evidence. Terracotta tends to raise PH levels quite a bit. I have a yabby system with lots of terracotta hides and the PH always sits around 8. Good for the yabbies because they like alkaline water, but it does limit what plants will grow in that system. If I wanted to use a quartz rock (had dismissed it as it fizzed a little in vinegar but am curious about this), could using terracotta pipe hides counteract it? Would it be safe to say that if the water is PH 7, the quartz brings it to 6, or the terracotta takes it to 8, that using the two together would take it back to 7? Hypothetical but am wondering how easy it would be to stabilise system - especially if shellgrit can be added to buffer the growbeds as well. It is usually better to use as many PH neutral components as possible rather than trying to juggle too many variables. I accept the limited plant options in that smaller system to make the yabbies happy and use my bigger system with fish in it for max plant growth. Quartz won't react to the vinegar nor will it dissolve/react with the water (except over geological time spans). So what you have fizzing with the vinegar is almost inevitably some limestone, or something very similar, like dolomite. You may have predominantly quartz, but there must be some limestone mixed in with it. Having the limestone in there is not a problem, in fact most peop,e put some in their system somewhere to keep the alkalinity up and buffer the system. Too many variables in a new system as it is without adding more I am realising... at least now I know what terracotta piping will do if its added, which I may not have considered right away if I had a ph fluctuation and couldnt work out what from.